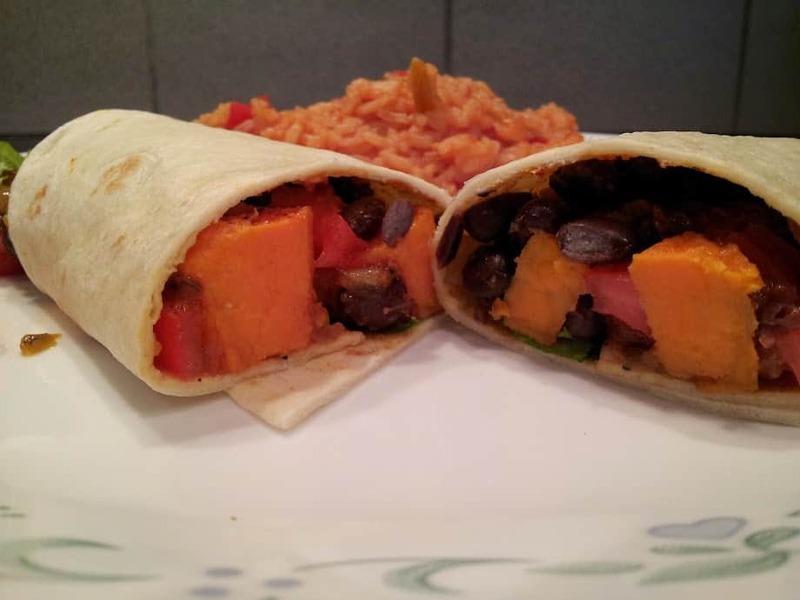 Sweet potatoes on a burrito? What’s this madness you ask? I’m telling you, you have to try these because they are awesomely yummy – especially with a black bean sidekick. 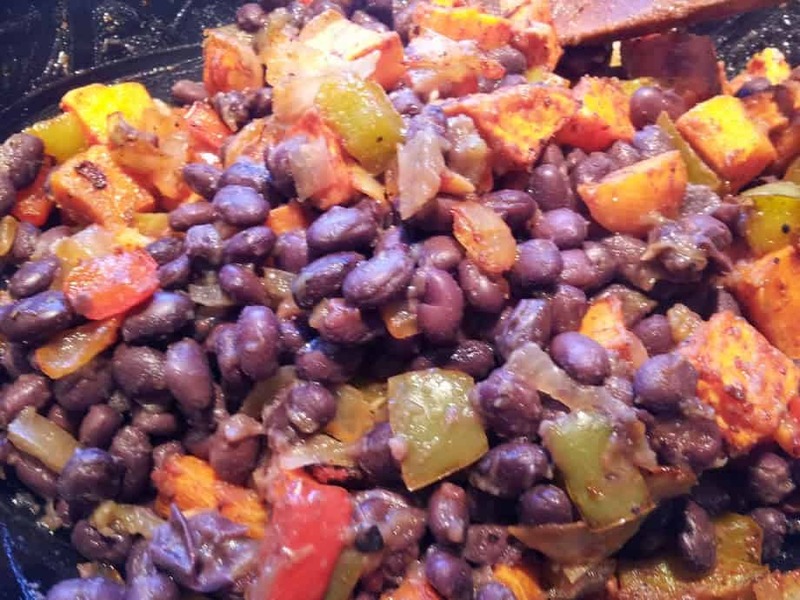 Sweet potatoes AND black beans? Together? I know, I know, it sounds weird. But put them together in a soft flour tortilla and magic happens. Sweet potato burritos are slightly sweet and slightly spicy and make the perfect choice for a healthy lunch, snack, or dinner. Top them off with some fresh tomatoes, garden lettuce, or Hatch Green Chile Sauce. I paired mine with some Easy Spanish Rice for a quick, nutritious, dinner full of vitamins, protein, and fiber. But me? I want sweet potatoes! Start off by cutting up a large red sweet potato, 1/2 a green bell pepper, 1/2 a red bell pepper, and a small onion into a large bowl. Add some salt, pepper, garlic powder, cumin, and chili powder and toss to coat. Now you’re going to roast them for about 20 minutes at 425 degrees. Meanwhile, drain and rinse a can of Black Beans and add a tablespoon of salsa, or Hatch Green Chile Sauce, and 2 teaspoons of lime juice. Cook on low until heated through, and then mix everything together. Place about 1/4 cup of this mixture down the center of a soft, warm, flour tortilla and wrap. At this point, you can either eat them plain or place the burritos seam-side down on a cookie sheet and bake for an extra 10 minutes or so at 375 degrees. 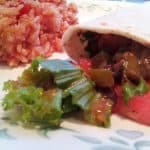 If you decide to use vegan cheese in or on these burritos, the extra oven time will allow it to all melt together. I purposely left the cheese out to keep the fat content down. Either way – these sweet potato burritos are seriously addicting and you’ll wonder why you’ve never heard of this delicious combination before. Don’t turn your nose up with that ugly face…. seriously just try one. 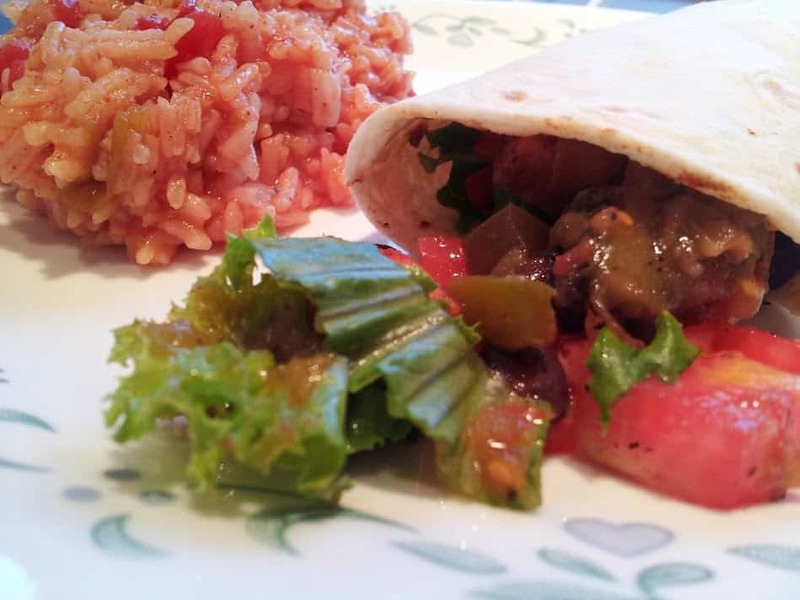 Mix sweet potatoes and black beans together in a soft flour tortilla and magic happens. Sweet potato burritos are slightly sweet, slightly spicy, and the perfect choice for a healthy, nutritious lunch, snack, or dinner. 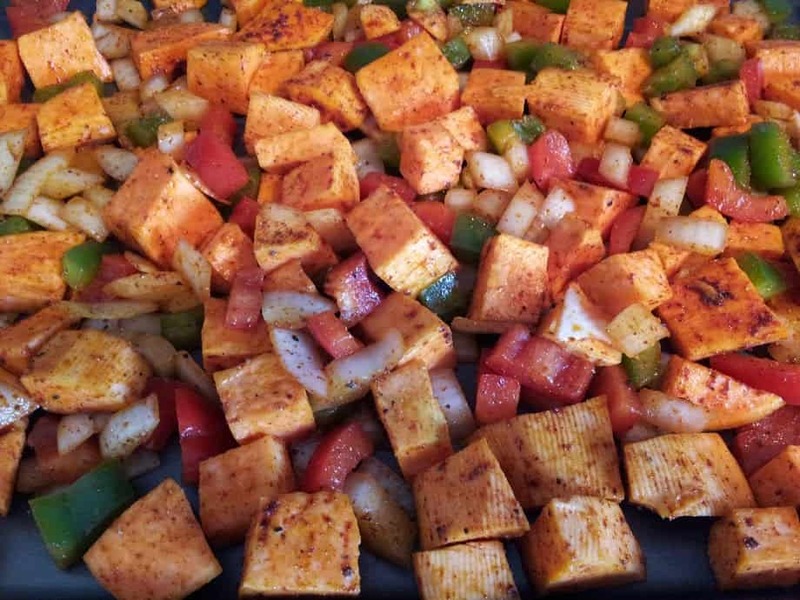 In a large bowl, add the veggie mixture, 2 Tbs water, salt, pepper, garlic powder, cumin, and chili powder. Toss until evenly coated. I looooove sweet potatoes so this sounds amazing to me! Sweet potatoes are my favourite, this sounds like something I have to make! My wife could not believe how much just one of these filled her up. Why do you have oil in your recipes? Aren’t you a McDougaller? Why do you have oil in your recipes? Aren’t you a McDougaller? No judgement, just surprised. I am, and I also needed a way to get the spices to stick so I could roast them. I still use olive oil on occasion, but then very, very sparingly. I guess I felt the 1/2 tablespoon was a marginal amount. Feel free to roast the veggies dry or sauté them in water but it may change the flavor. Thanks. I understand. Great recipe. I just got nailed on the McDougall Board too. I should have known better. It seems the oil police are out in full force today. Lesson learned. Wow I hate to see people attack you over that tiny bit of oil. This recipe looks amazing, and I’m so glad you posted it. I don’t find the sweet potato and black bean combo to be weird, but then again I love strange things! 🙂 Thank you so much for posting, and don’t let people get you down! Really good. I froze some of them and they are great for breakfast. Microwave a little to defrost and they dry fry on a skillet until browned a bit. Then I ad a little salsa.